1935: The First Full Year Under The Draconian Production Code (Post Seven) | THAT'S ENTERTAINMENT! Welcome to another Film Friday! Today we’re continuing our series on films released in 1935, the first full year in which Hollywood studios were forced to adhere to the Production Code, which became official in the summer of 1934. The pictures we’ll be looking at are not connected by performers, but rather by their common bond to the censoring of creativity. So far we have covered The Goose And The Gander, Dangerous, No More Ladies, Star Of Midnight, Alice Adams, and Goin’ To Town. 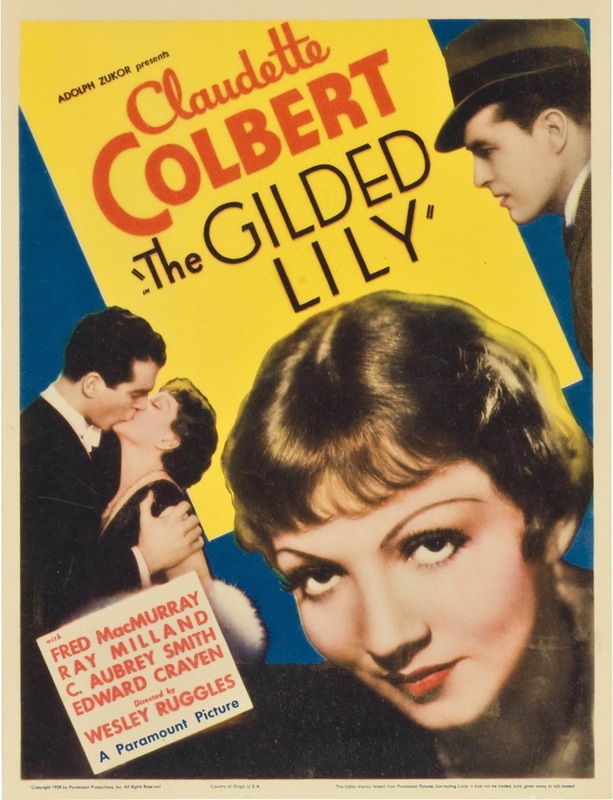 Today we’re looking at The Gilded Lily! A news reporter turns the woman he loves into a media star after she rejects an aristocrat’s marriage proposal. Starring Claudette Colbert, Fred MacMurray, Raymond Milland, and C. Aubrey Smith. Screenplay by Claude Binyon. Suggested by a story by Jack Kirkland and Melville Baker. Directed by Wesley Ruggles. A surprisingly solid picture, Colbert and MacMurray have wonderful chemistry and alternately radiate both humor and warmth. There are laughs, there are moments of quiet reflection, and the narrative is tightly constructed in a mostly organic fashion. Aside from the stars, the plot itself warrants some accolades due to its originality. “Stenographer Marilyn David, known as Lynn, and her best friend, reporter Peter Dawes, meet every Thursday night on a bench at the New York Public Library, where they eat popcorn. Lynn, however, meets vacationing English aristocrat Charles Gray Granville, and they fall in love, although he keeps his royal identity a secret. Gray is already engaged to a British woman, Helen Fergus, and when he tells his father, Duke of Lomeshire, that he wants to marry Lynn, the duke insists they return to England and break the engagement properly. 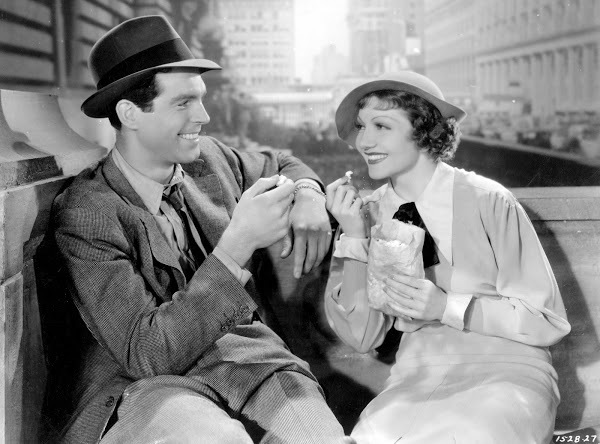 Gray lies to Lynn about why he’s leaving New York, but Pete meets the Granvilles at the dock, where Gray tells him that nothing of significance happened to him in New York and that he is still engaged to Helen. Furious that Gray used the woman he loves, Pete prints an article about Lynn, whom he calls “No Girl,” leaving Gray at the altar and forcing him to return to England heartbroken. When the Granvilles, onboard ship, receive word that Helen has broken her engagement because of the scandal, the duke assumes Lynn is trying to blackmail him. Gray then sends Lynn a telegram at work asking her price to forget him, and when her boss subsequently calls her “duchess,” she quits her job. Pete then decides to capitalize on Lynn’s publicity and make her a celebrity. He gets her a job as a singer and dancer at Nate’s Cafe, despite the fact that she can neither sing nor dance. As is commonplace with films of the era, the principal reason for seeking out The Gilded Lily is adoration for either of its two stars. (I’m not considering Milland a star here, since his role is so bland — one of the inevitable and only slightly disappointing elements of the screenplay.) 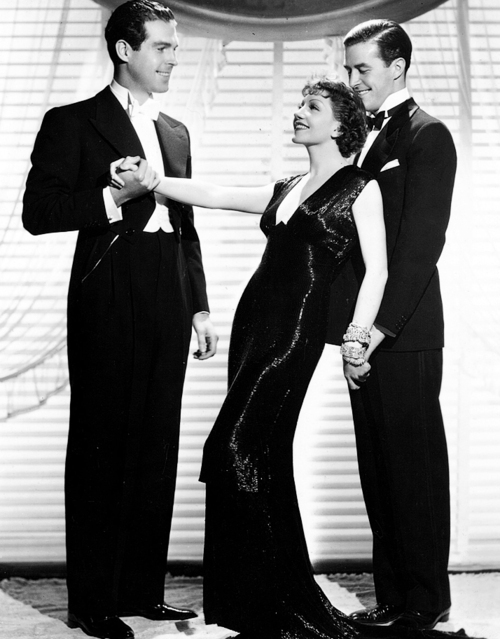 The first pairing of MacMurray and Colbert is heavenly — they have a supremely understated chemistry that, though not as flashy as a team like Crawford and Gable’s, really sparkles and brings a cinematic humanity to their scenes. Their strengths together and apart allow for more dimensionalized characters, whose actions are better motivated because of their mutual integrity. 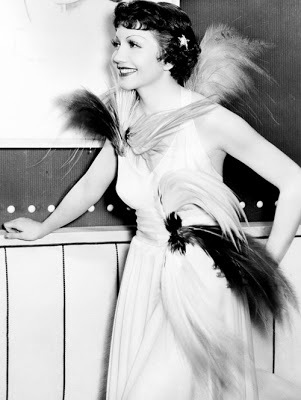 Colbert is one of the cinema’s finest actresses, and though she’s remembered most for her screwball comedies, let it be known that she was one of Paramount’s most versatile leading ladies. Here the genre is a sort of light comedy, but rest assured she’s a hoot. The two most notable Colbert moments: the drunk bit when MacMurray’s character decides to turn her into a celebrity, and the disastrous (and painfully realistic) opening night that launches her to stardom. Meanwhile, MacMurray has such charm — arrogance balanced with empathy, and he really drives the plot and the picture forward. The scenes between Colbert and MacMurray are probably the film’s best, as evidenced even through the opening scene, in which the two sit on a park bench and eat popcorn: their marvelously casual and romantic routine that’s repeated several times throughout the picture. The story goes forward, not terribly unpredictably, while we desperately want Colbert to come to her senses about MacMurray. 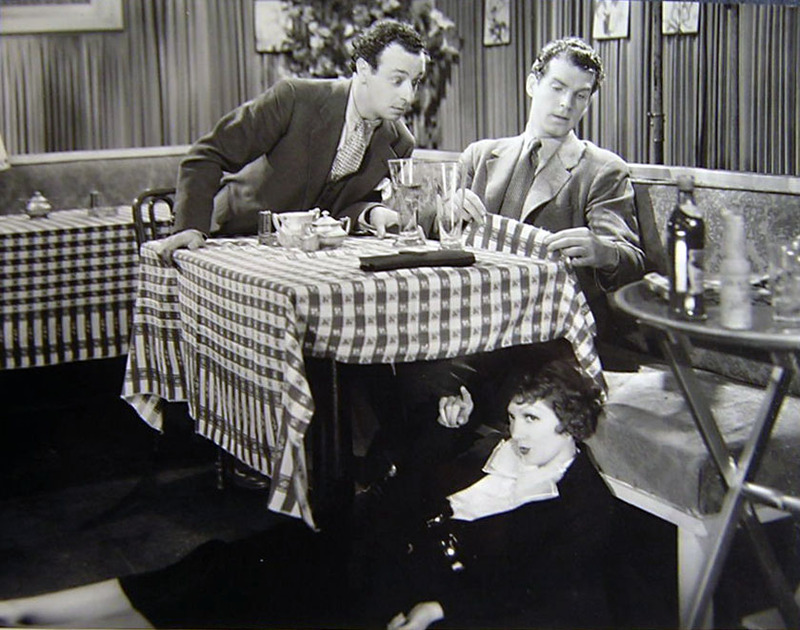 However, with the creation of “The ‘No’ Girl,” the film takes a unique and comedically memorable turn that separates The Gilded Lily from other serio-romcoms of the era, lampooning the stardom afforded to non-celebrities whose claim to fame is predicated on something either hyperbole or entirely fabricated. The narrative smartly reintroduces Milland’s character and Colbert (unsurprisingly) returns to him. This is a nice twist, that is essential for the story. Thankfully, though, she does wise up and return to MacMurray in the wonderful final sequence in which they both desperately try to return to their park bench. This film is akin to a diamond in the rough. Okay, maybe not a diamond. But it’s something shiny and valuable — an under-sung picture with an engrossing story, wonderful performances, and some much appreciated chemistry. Fans of Colbert and MacMurray, this is a must. Others, certainly take the time to watch this film if you have the chance. There’s much to enjoy here! I ended up buying this movie based on your review. Thanks for the recommendation! I loved it! Hi, Jeffrey! Thanks for reading and commenting. Terrific — I’m very glad to know that!